← A Bronze Aged temple to the gods or a 20th century make over: is Stonehenge all its cracked up to be? There’s no doubting the whole Olympic thing has been beefed up by the officials and given the close ties with McDonald’s, that is hardly surprising. But for me, standing in the torrential rain and howling wind in the eager anticipation of something really rather wonderful and uplifting happening to make the wait seem worthwhile, it turned out to be more of a damp squib and I’m going to put my everso English neck on the line here and say what we are all told we shouldn’t say….. I was very disappointed. There, I’ve said it and I feel much better for it albeit somewhat unpatriotic. Well here’s the thing, I was determined to underline the value of this great event for the benefit of my son, so he could feel proud to be British and see something that was really rather special and unique and remember the occasion for years and years to come. To see something ‘live’ and in the flesh is far more interesting than watching it second-hand on the TV, wouldn’t you agree? So I duly made my way along the country roads that were still knee-deep in stones, grit and mud from the various landslides we’ve had but assumed the deluge of rain that was now falling would either help to clear the mess or add yet more. 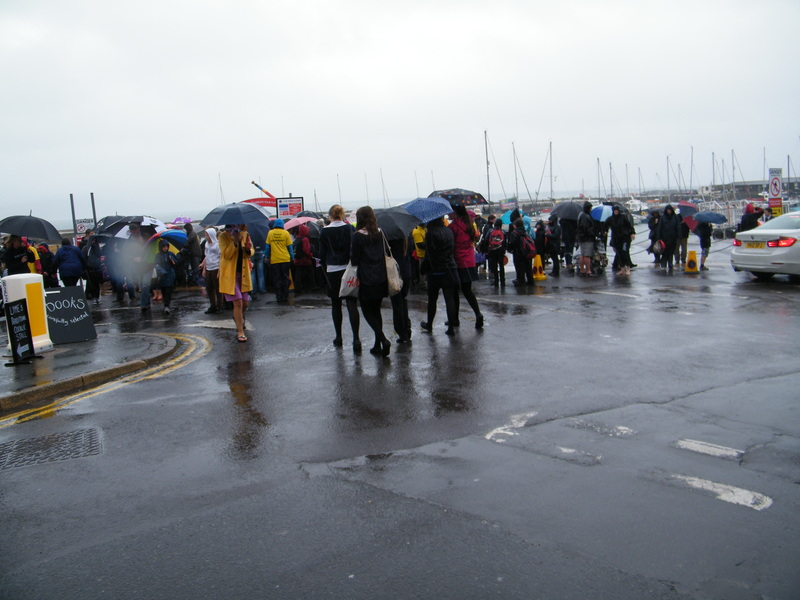 Either way, I braved the elements to bear witness to the great event at Lyme Regis. By the time I started to make my way down to the Cobb, having parked in the top carpark (on the assumption the bottom one would be full), it was raining heavily and given the cross winds, my flimsy umbrella afforded me very little protection. But I battled on, if only to find my son whom I knew had no jacket and was wearing just a thin summer school T-shirt. So, son located and position secured I dutifully waited and before long, the inevitable jostling of the crowd began, which given the small numbers and ample room was quite an achievement madam – you know who you are – and before long the umbrellas were locked in gladiatorial style as we all showed gritted determination to stand our ground in order to get the best view of the Torch Bearer. I noticed the Coca-Cola van was there handing out opened bottles of ‘limited edition’ bottles of the brown stuff – of course that all depends on your definition of ‘limited’ and given the money being paid for the unopened bottles via the mercenaries’ wonderworld of Ebay, the cynic in me says that’s why they were so kindly opening them for the eager fans. 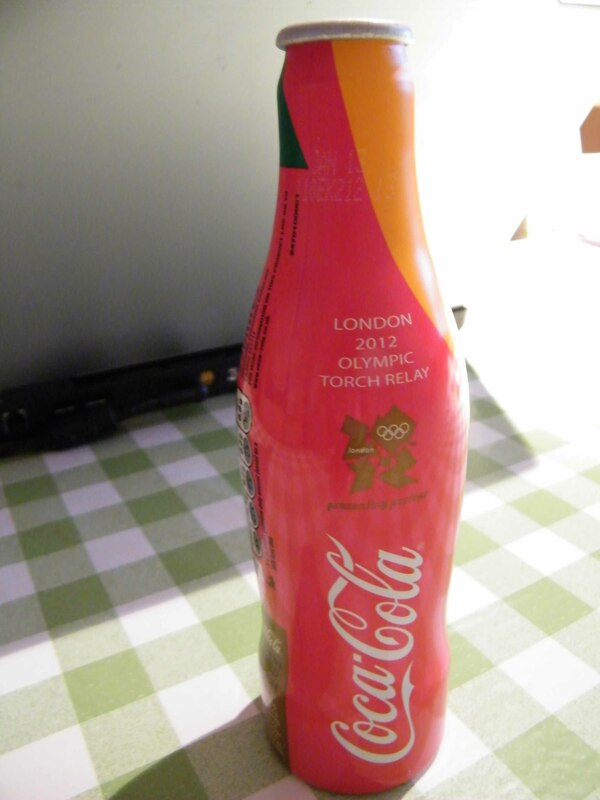 Although I personally think hot co-co would have gone down far better than cold Coca-Cola. One hour later, my fingers were white and the numbness was moving equally rapidly from my finger tips down and from my toes up, I began to wonder what might happen if the two met in the middle; anyway the word went round, they were on their way down the hill. 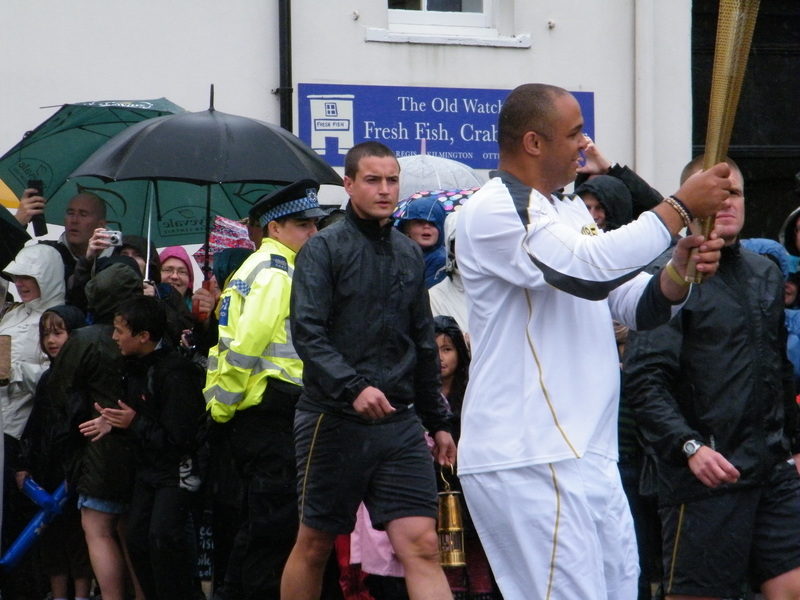 First the police motorcycle outriders with blue flashing lights, then the police cars (two of), then the support vehicles, then the support staff and finally, the Torch Bearer himself walked down the steep hill with the flame just about managing to survive the ravages of our English summer. I have no idea who he was, they may have announced it, but I was negotiating my eyeballs out of an umbrella prong’s frantic jabbing, so too preoccupied with saving my eyesight to think about Joe Public’s name. 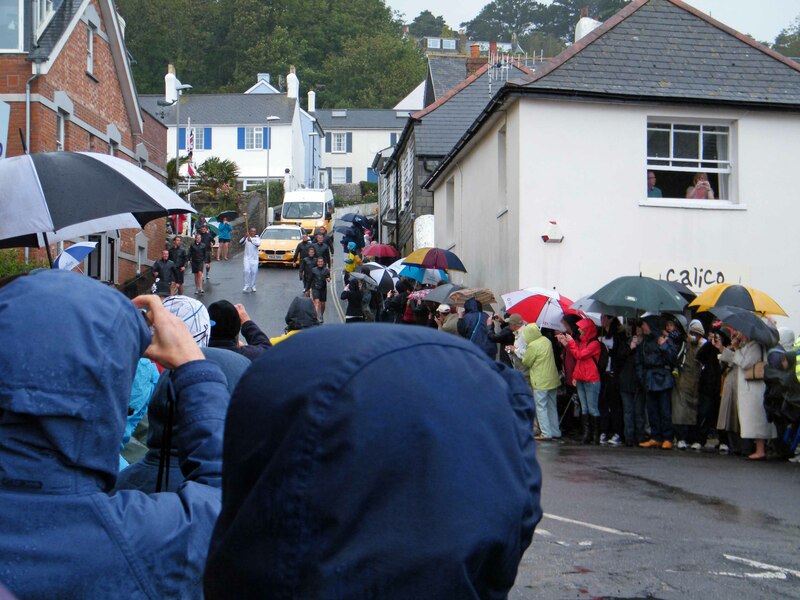 Mr Torch Bearer circuited the opposite side of the road from me and made his way to the Cobb for photographs to be taken, some of the crowd dispersed at this point, but us stalwarts decided to wait and give another ‘hurrah’ as he came back up from the Cobb to greet his devoted fans. 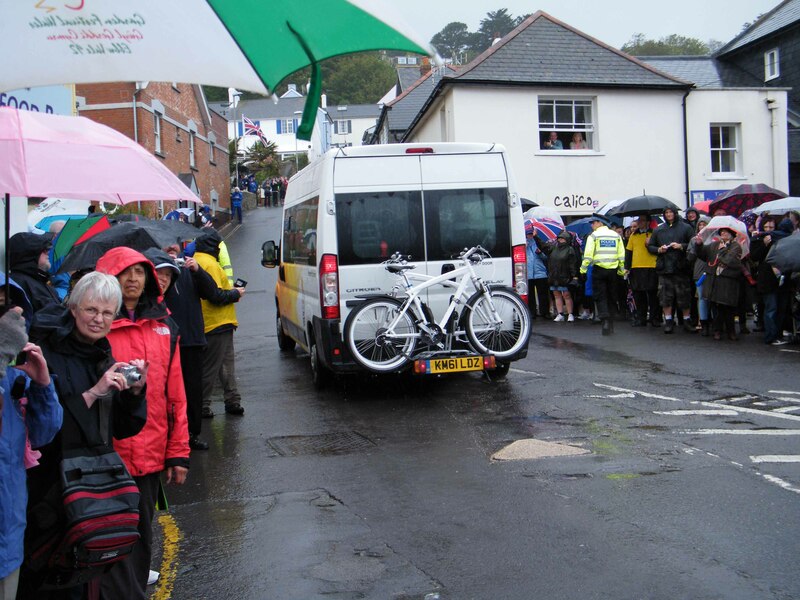 Sadly our extended stay was not rewarded as the walk onto the Cobb obviously proved too much and Mr Torch Bearer was bundled into the waiting van just next to the RNLI station without so much as a final flicker. I had hoped for a royal wave from the window of the van, but the condensation from wet bodies was so great inside the van that the windows had completely steamed up and we could see no one through the mist. 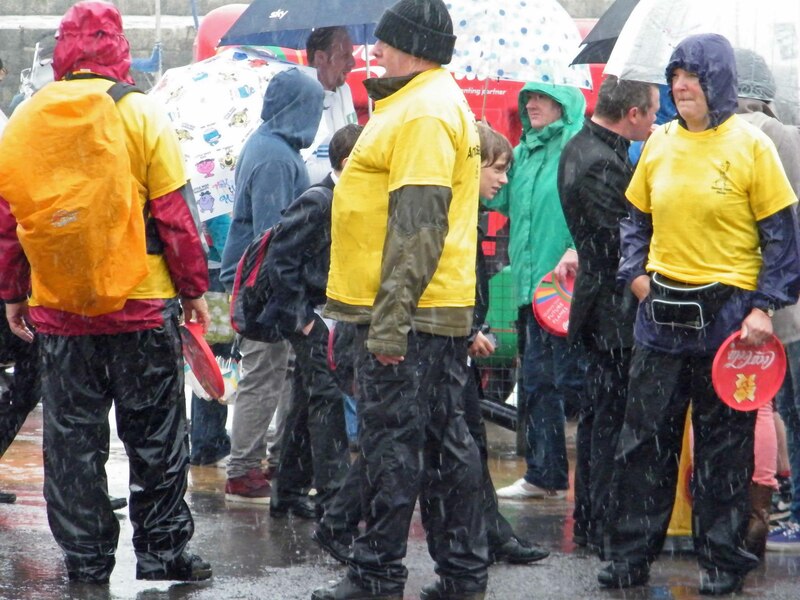 The throng of happy Olympian supporters slipped and slopped their way back to their vehicles, some so wet there seemed little point in worrying about walking through the river that was now rushing down the hill. We returned to our cars and as we sat waiting for the Olympic vehicles to leave in order of priority so they could hare over to Weymouth, the vapours from our soggy bodies soon started to rise so that before long everyone’s car looked like the Olympic van with steamed windows and unknown passengers on board. This was definitely a once in a lifetime experience because you won’t catch me doing it again! 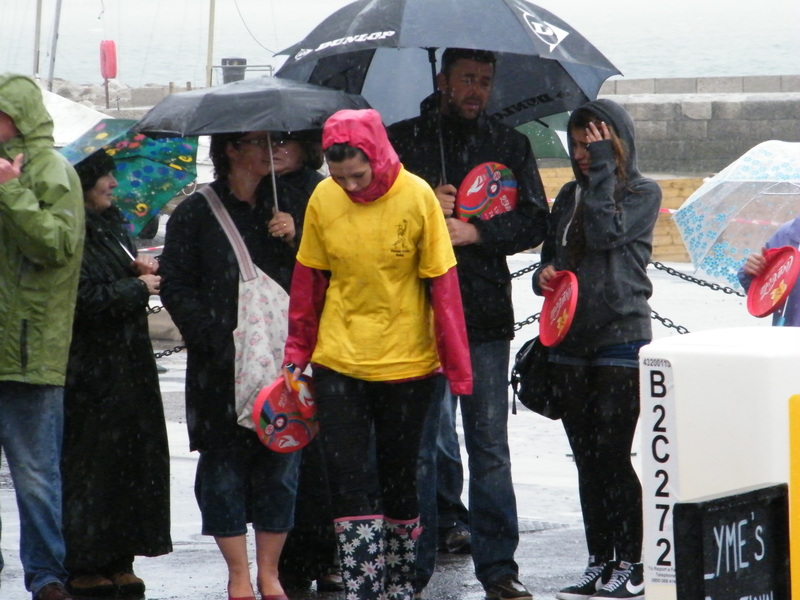 This entry was posted in Special events and tagged fans, games, Lyme Regis, olympian, Olympic torch, rain, sport summer, weather. Bookmark the permalink.